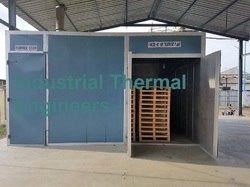 Prominent & Leading Manufacturer from Ahmedabad, we offer pallet dryer. Customers can avail from us wide spectrum of Pallet Dryer that is in accordance to the industry defined quality norms and specifications. The offered dryer is widely preferred by our clients due of its features like durability. Apart from this, the offered dryer is available with us at industry leading prices. The offered dryer is designed from high quality raw material that is bought from trustable vendors of the market. Working cost - 5- 6 Rupees per Pallet. Total cycle time - 3 to 4 hours. In our Hot Treatment Plant, chimney will not be there, so clearance from pollution control department will not be applicable. Looking for Pallet Dryer ?